Have you experienced these Enterprise Mobility Challenges? Enterprise mobility solutions are hugely beneficial for businesses, however what you need to keep in mind that it presents a number of challenges for businesses on an implementation level. There are times when it appears like extremely difficult to execute but the process becomes easier once enterprises recognize these challenges and overcome them to deploy an innovative enterprise mobility strategy. As it comes to setting up enterprise mobility solution, the biggest concern for the businesses is certainly security. Bring Your Own Device (BYOD) presents several benefits for businesses, comprising of increased productivity and cost saving, however, it welcomes many security challenges and risks, mainly among enterprise CIO’s. It is tough to keep sensitive corporate information secure, thus it’s tough to be cautious with BYOD. Meanwhile, your business information is kept secure with enterprise mobility management solutions as it is accessible to only those who require accessing it. By focusing on managing apps instead of devices can help you with security concerns. 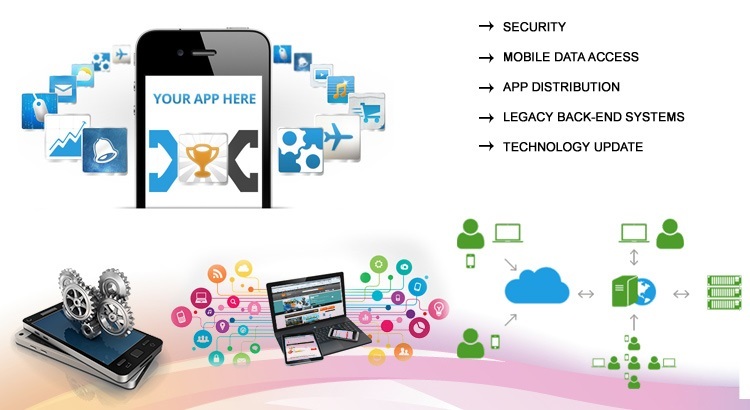 With a good MAM (Mobile Application Management) solution, you get enterprise flexibility and your IT department gets to apply different policies for different applications. Mobilizing your workforce is necessary; however it’s also essential that your employees get to access company data so they can make quick and decisive decisions whenever required. The businesses must provide live data access from mobile devices available in the office to the employees. This way your business and employee remain effective and efficient, though at the same time it presents security concerns. This is why your enterprises needs allow users to easily share data inside and outside the business with secure file sharing that’s integrated with backup. It’s a complex task to offer an easy access of the enterprise apps. From installing directly to each device to provide employees and users with tools to install themselves, it’s a difficult thing to do. You will face issues while managing UDID (Unique Device Identification) numbers to changing devices and more common BYOD policies. Nowadays it’s common to see businesses opting for MAM services in order to manage app accessibility for users and ensure security of the content within the apps. It’s required that you think about distribution to make sure all users have easy access to the app. There are few of the enterprise applications that can be deployed on the consumer store, so ensure the security of the app as anyone can utilize the app. it’s advised to implement a suitable login process. They help a great way in the management of business processes. Even though mobile is integral for most organizations, still there are many businesses that see back-end integration as a top challenge for mobile app development. As the enterprises turning more mobile-centric, they struggle with back-end integration. However, these challenges can be dealt with by maximizing efficiency by leveraging mobile platforms in order to accelerate development while reducing complexity. By overcoming these challenges, there are lots of possibilities for enterprise. Are you concerned about customers leaving your application? How ASP NET Development can make your Dynamic Pages attractive?